Any parent knows that there are no fine lines deciphering “naughty or nice.” Let’s face it comrades: if it were that black or white then the North Pole would probably have gone out of business a long time ago. But luckily the holiday incentive model is left up to interpretation, and one woman’s idea has seriously pulled at our heartstrings this holiday season. Kindness Elves, the new “Elf on the Shelf” hybrid that still feeds off creativity and the imagination of youngsters, but inspires kindness and awareness during the holiday season- a much better alternative to the gift-centric naughty elf who reports back to the North Pole via some pretty un-yielding criteria. Kindness Elves appear at the household of children who have already set an example of kindness in their communities, and spend the holiday month collaborating with children about how to keep being leaders of kindness. Through a system of elf mail and pure magic, these cuties come alive in your household and keep your child believing. This adorable concept was imagined by Anna Ranson, the Mom and mastermind behind The Imagination Tree. The elves work overnight to provide children with a kindness challenge. For instance, children may wake up to find their kindness elves holding a spatula and lounging in a mixing bowl, with a note saying “let’s make cookies for our neighbor today.” Like “Elf on the Shelf,” they need a little “magic” from parents but are worth the extra effort. 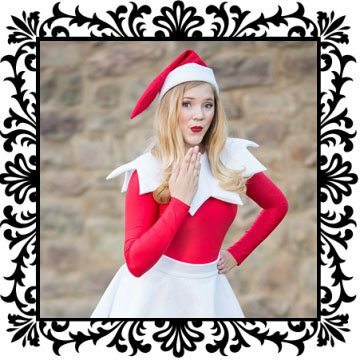 The Kindness Elves have a comprehensive online store, with many creative and learning-centered accessories. After all, its parent site is The Imagination Tree, a creative play and learning resource for kids and parents. The online Elf store starts their sets off as low as $26.49, or for DIY Kindness Elves, check out these adorable pinecone renditions and crafting instructions. The best news is that you can also use your existing “Elf on the Shelf” to make the Kindness Elf magic happen. No point in wasting an elf! Just have your elfie adapt to the model of the Kindness Elves and watch the magic happen. How Do Kindness Elves Work? 1. Introduce your elves to your family/children with a letter from the elves explaining that they’ve arrived because of your child’s commitment to kindness and the acts of kindness that child has already shown. This is an important step in acknowledging a child’s philanthropy and will keep the momentum going through the process. 2. Surprise children with challenges from the above kindness list or our Pintrest lists and set up elves at night to be doing something related to each challenge. Children love the magic of glimpses into what toys do while no one is looking. It’s also a great way to stimulate learning and imagination. 3. Some mornings, children may wake up to find the elves have lined up their shoes, tidied their coats, got the breakfast things ready or fixed a broken toy. Modeling direct ways to be kind and helpful as a prompt for the children in the day can count as a daily challenge. 4. Encourage children to write letters back to the elves explaining why they enjoyed doing certain challenges and what they learned. The kindness elves you can buy come with intricate mailboxes and add-ons, but they’re not necessarily mandatory to participate. Make your own mailbox from an old matchbox or such and make it an exciting part of your child’s day to check their elf mail. 5. Check out our Pinterest for additional visual inspiration.